Most tap and well water in the U.S. contain moderate to heavy levels of contamination from industrial and environmental pollution. All sources of water whether it be a lake, river, glacier or well, contain some level of contamination. The majority of contaminant levels are not high enough to cause immediate sickness but are more likely to cause chronic health effects. This means effects that occur long after repeated exposure to small amounts of a contaminant. 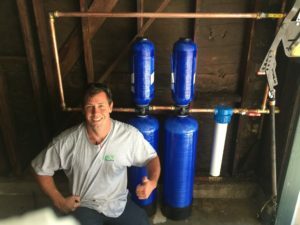 Installing a whole house water system can solve a wide range of problems affecting your water quality, taste, or appearance of the water. Whole house filtration systems are designed to remove rust, sediment, chlorine and other chemical contaminants from all water entering your home. All of the water coming into your house will pass through the filter before being routed to faucets, toilets and appliances in the house. So no matter where you are in your house, whether it’s the guest bedroom shower, outside hose, kitchen or bathroom sink, you and your family can have clean, healthy and great tasting water. Not only does a whole house water filter give you the luxury of clean great tasting water from every faucet in the house it can also help extend the life of appliances that use water, such as dishwashers, water heaters and washing machines, because it removes the sediment, chlorine and other contaminants that would otherwise be entering those appliances. Disease producing micro-organisms, which includes bacteria, viruses, parasites. Trihalomethanes, byproducts formed when chlorine in treated drinking water combines with naturally occurring organic matter. *Volatile Organic Chemicals (VOCs), which include solvents, degreasers, gasoline additives, etc. Toxic metals such as arsenic, barium, chromium, lead, mercury, etc. Radioactive contaminants that result from the decay of uranium in soils and rocks. Hard water minerals such as calcium and magnesium cause scale buildup to attach on surfaces like pipes and appliances to cause lime deposits. Only a few of the contaminants listed above are regulated by drinking water standards. This stresses the importance of whole house water filtration, to protect you from the wide range of contaminants in your water source. Enjoy the health benefits of a whole house water filter and the peace of mind that comes with clean water. Call Green’s Plumbing today for more information.